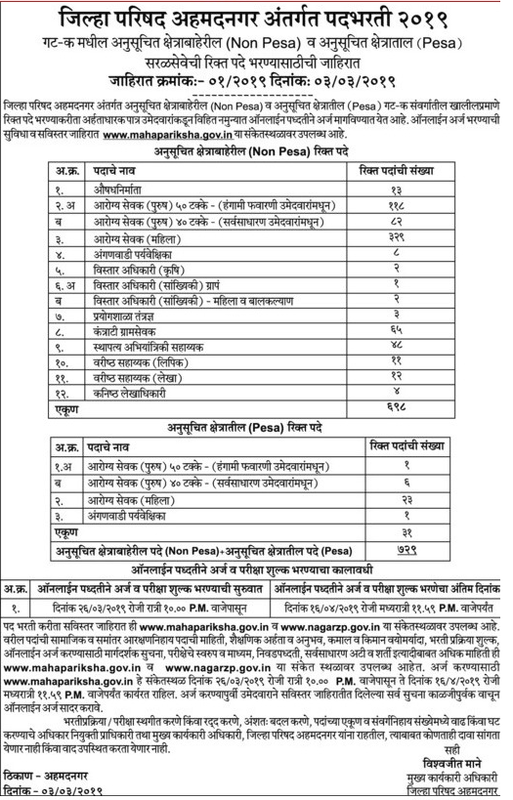 Gram Vikas Vibhag Ahmednagar (ZP Ahmednagar), Ahmednagar published a new job notification for Junior Engineer, Gramsevak, Pharmacist, Health Worker, Health Worker, Arogya Sevak, Extension Officer (Agriculture), Civil Engineering Assistant, Live Stock Supervisor (Animal Husbandry), Senior, Assistant (Account), Supervisor (ICDS), Extension Officer Posts. The recruitment is for total 729 Vacancies. The willing candidates are informed to see the latest notification March 2019.Last Date of Online application is 16-04-2019. For More details of Gram Vikas Vibhag Ahmednagar Recruitment 2019 Read Below.